Throughout his career Dilworth has been committed to geometric abstraction. His sculptures explore the nature of movement and direction through rotation and repetition. Working in wood and steel, geometry is the basis of his constructions and as such eschews any reference to human form or the natural environment. This is art emanating from the mind rather than reproducing or abstracting shapes already found in nature. Like other English Constructivists, such as Kenneth Martin, Dilworth seeks to create works derived from man-made systems which, although avoiding sentimentality, are not without sentiment. 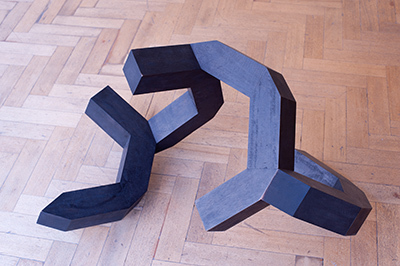 In his use of tubular steel rods, wooden cuboids and cut-out steel sheets, Dilworth actively seeks to establish a tension between the visual clarity of his forms and the emotional responses that they evoke. Using systematic, mathematically based units, Dilworth experiments with shape and spatial arrangement for the discovery of unplanned harmonies. He explained that 'Play is a very important part of the activity. I believe that by organizing and manipulating the elements I am using, I discover possibilities I could not have prefigured'. Physicality and the boundaries of space are central to Dilworth's thinking: his sculpture is concerned with the physical, with movement, stretching, rotating and shifting. As such his sculptures, whether large free-standing floor pieces or smaller, more intimate works, demand a reflexive interaction from the audience. We are called to think about how we move through space and our presence within it. Recalling the phenomenological propositions of philosopher Edmund Husserl, Dilworth's sculptures suggest that essential truths are discoverable in experience. By physically being with and moving between and around these sculptures, Dilworth generates a capacity for 'experience', unencumbered by theoretical prejudices and presuppositions. Born in Wigan in 1931, Dilworth studied at Wigan School of Art, before gaining a place at The Slade where he studied until 1956. In 1955, he won the Tonks Prize, and the following year the Sunday Times Drawing Prize. He was awarded a French Government Scholarship in 1956, allowing him to study in Paris where he became interested in Mondrian's geometric abstraction. Back in London in 1958, he embarked on a journey towards Concrete Art that would define his entire career. Despite exhibiting regularly in the 'Young Contemporaries' exhibitions throughout the 1950s, he found his work better received in Europe and has been granted solo exhibitions at the Mondrian House in Amersfoort, Holland, the Stedelijk Museum in Amsterdam and more recently at the Musée Matisse, Cateau-Cambressis, France, in 2007. In Britain his influence on the development of sculpture is perhaps best known through his curatorial project, Pier + Ocean held at the Hayward Gallery in London in 1980. In this exhibition Dilworth and co-curator Gerhard Von Graevenitz presented the development of Concrete Art to Britain through a display of Minimal Art and Land Art, Conceptual Art, Arte Povera, Systems and Geometric Abstraction. Gimpel Fils is pleased to announce that this solo display is the first stage of a touring retrospective exhibition curated by Andrew Bick. The exhibition will be on display at the Turnpike Gallery in Leigh from Saturday 7 May to Saturday 2 July 2011, and the Huddersfield Art Gallery later in the year. Reflecting on Theo van Doesburg's contention regarding the constituent parts of painting is a useful starting point when thinking about the work of Knut Navrot. Navrot's paintings are unapologetic arrangements of colour and shape, conceived not only to demonstrate the artist's clarity of intent but also to examine the very nature of painting. Navrot suggests that 'art does not enjoy a priori validation, but it must always wonder about its raison d'être', and as a consequence, his works tests the limits and boundaries of painterly practice. Although Navrot does not profess any particular kinship with constructivist art, his work nonetheless betrays a lineage that can be traced through van Doesburg, Mondrian, Ad Reinhardt and Donald Judd. Navrot's Concrete paintings are uncompromising in their disciplined approach to composition. Planes of pure colour meet at horizontal, vertical and diagonal intersections, asserting their autonomy not only from one another, but also from the outside world. Max Bill explained that 'Concrete painting eliminates all naturalistic representation; it avails itself exclusively of the fundamental elements of painting, the colour and form of the surface. Its essence is, then, the complete emancipation of every natural model: pure creation.' Navrot's paintings are to this extent manifestations of pure creation. Knut Navrot was born in 1955 in Paris, where he continues to live and work. His solo exhibitions include his 1984 exhibition at the Centre Culturel de Meudon and Repères á la Galerie Lahumière, Paris in 1993. Navrot's paintings have been included in group shows in Tokyo, Washington, Chicago, Krakow, Warsaw and London, as well as in exhibitions throughout France and Germany. His work can be found in a number of public collections, including the Ukrainian Institute of Art, Chicago, the Musée de Pontoise and L'Espace pour l'art concret, Mouans-Sartoux. Knut Navrot is represented by Galerie Gimpel et Müller, Paris. This is his first solo exhibition in the UK.